The grain in this blast-blighted wheat head has been turned to chaff. Wheat blast — one of the world’s most devastating wheat diseases — is moving swiftly into new territory in South Asia. In an attempt to curb the spread of this disease, policymakers in the region are considering a “wheat holiday” policy: banning wheat cultivation for a few years in targeted areas. Since wheat blast’s Magnaporthe oryzae pathotype triticum (MoT) fungus can survive on seeds for up to 22 months, the idea is to replace wheat with other crops, temporarily, to cause the spores to die. In India, which shares a border of more than 4,000 km with Bangladesh, the West Bengal state government has already instituted a two-year ban on wheat cultivation in two districts, as well as all border areas. In Bangladesh, the government is implementing the policy indirectly by discouraging wheat cultivation in the severely blast affected districts. CIMMYT researchers recently published in two ex-ante studies to identify economically feasible alternative crops in Bangladesh and the bordering Indian state of West Bengal. The first step to ensuring that a ban does not threaten the food security and livelihoods of smallholder farmers, the authors assert, is to supply farmers with economically feasible alternative crops. In Bangladesh, the authors examined the economic feasibility of seven crops as an alternative to wheat, first in the entire country, then in 42 districts vulnerable to blast, and finally in ten districts affected by wheat blast. Considering the cost of production and revenue per hectare, the study ruled out boro rice, chickpeas and potatoes as feasible alternatives to wheat due to their negative net return. In contrast, they found that cultivation of maize, lentils, onions, and garlic could be profitable. The study in India looked at ten crops grown under similar conditions as wheat in the state of West Bengal, examining the economic viability of each. The authors conclude that growing maize, lentils, legumes such aschickpeas and urad bean, rapeseed, mustard and potatoes in place of wheat appears to be profitable, although they warn that more rigorous research and data are needed to confirm and support this transition. Selecting alternative crops is no easy task. Crops offered to farmers to replace wheat must be appropriate for the agroecological zone and should not require additional investments for irrigation, inputs or storage facilities. Also, the extra production of labor-intensive and export-oriented crops, such as maize in India and potatoes in Bangladesh, may add costs or require new markets for export. There is also the added worry that the MoT fungus could survive on one of these alternative crops, thus completely negating any benefit of the “wheat holiday.” The authors point out that the fungus has been reported to survive on maize. In both studies, the authors discourage a “wheat holiday” policy as a holistic solution. However, they leave room for governments to pursue it on an interim and short-term basis. In the case of Bangladesh, the researchers assert that a “wheat holiday” would increase the country’s reliance on imports, especially in the face of rapidly increasing wheat demand and urbanization. A policy that results in complete dependence on wheat imports, they point out, may not be politically attractive or feasible. Also, the policy would be logistically challenging to implement. Finally, since the disease can potentially survive on other host plants, such as weeds and maize—it may not even work in the long run. In the interim, the government of Bangladesh may still need to rely on the “wheat holiday” policy in the severely blast-affected districts. In these areas, they should encourage farmers to cultivate lentils, onions and garlic. In addition, in the short term, the government should make generic fungicides widely available at affordable prices and provide an early warning system as well as adequate information to help farmers effectively combat the disease and minimize its consequences. In the case of West Bengal, India, similar implications apply – although the authors conclude that the “wheat holiday” policy could only work if Bangladesh has the same policy in its blast-affected border districts, which would involve potentially difficult and costly inter-country collaboration, coordination and logistics. 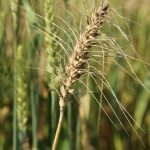 The CIMMYT researchers urge the governments of India and Bangladesh, their counterparts in the region and international stakeholders to pursue long-term solutions, including developing a convenient diagnostic tool for wheat blast surveillance and a platform for open data and science to combat the fungus. A promising development is the blast-resistant (and zinc-enriched) wheat variety BARI Gom 33 which the Bangladesh Agricultural Research Institute (BARI) released in 2017 with support from CIMMYT.However, it will take at least three to five years before it will be available to farmers throughout Bangladesh. The authors urged international donor agencies to speed up the multiplication process of this variety. CIMMYT scientists in both studies close with an urgent plea for international financial and technical support for collaborative research on disease epidemiology and forecasting, and the development and dissemination of new wheat blast-tolerant and resistant varieties and complementary management practices – crucial steps to ensuring food security for more than a billion people in South Asia. First officially reported in Brazil in 1985, where it eventually spread to 3 million hectares in South America and became the primary reason for limited wheat production in the region, wheat blast moved to Bangladesh in 2016. There it affected nearly 15,000 hectares of land in eight districts, reducing yield by as much as 51 percent in the affected fields. 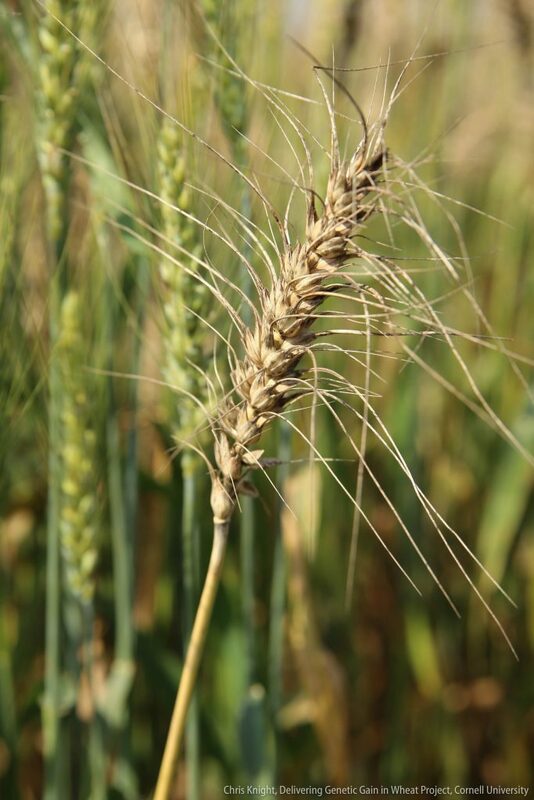 Blast is devilish: directly striking the wheat ear, it can shrivel and deform the grain in less than a week from the first symptoms, leaving farmers no time to act. There are no widely available resistant varieties, and fungicides are expensive and provide only a partial defense. The disease, caused by the fungus Magnaporthe oryzae pathotype triticum (MoT), can spread through infected seeds as well as by spores that can travel long distances in the air. South Asia has a long tradition of wheat consumption, especially in northwest India and Pakistan, and demand has been increasing rapidly across South Asia. It is the second major staple in Bangladesh and India and the principal staple food in Pakistan. Research indicates 17 percent of wheat area in Bangladesh, India, and Pakistan — representing nearly 7 million hectares – is vulnerable to the disease, threatening the food security of more than a billion people. CIMMYT and its partners work to mitigate wheat blast through projects supported by U.S. Agency for International Development (USAID), the Bill and Melinda Gates Foundation, the Australian Centre for International Agricultural Research (ACIAR), Indian Council for Agricultural Research (ICAR), the CGIAR Research Program on WHEAT, and the CGIAR Platform for Big Data in Agriculture. The MARPLE (Mobile And Real-time PLant disease) project – a project to test and pilot a revolutionary mobile lab in Ethiopia, led by the John Innes Centre, the International Maize and Wheat Improvement Center (CIMMYT) and the Ethiopian Institute of Agricultural Research (EIAR)—won the CGIAR Platform for Big Data in Agriculture Inspire Challenge Scale Up award in 2018. The Inspire Challenge encourages CGIAR partners, universities and others to use big data approaches through innovative pilot projects to advance agricultural research and development. To be named a winner, projects must have real potential for developmental impact, have mobilized underused or misused data, and demonstrate meaningful partnerships with CGIAR and other sector members. Ultimately, the Inspire Challenge looks for novel approaches to inform policies and applications in agriculture and food security. We sat down with CIMMYT Principal Scientist and rust pathologist Dave Hodson to ask him about the project and its relationship with Big Data for Agriculture. What is the significance of Big Data to your work? Advances in sequencing technology, and the use of innovative big data approaches on sequence data from thousands of yellow rust isolates, opened the door for Diane Saunders and colleagues at the John Innes Centre in the UK to develop revolutionary, near-real time, mobile pathogen diagnostic techniques using portable palm-sized gene sequencers. The final result being the first operational system in the world using nanopore sequence technology for rapid diagnostics and surveillance of complex fungal pathogens in situ. How do you see the role of the CGIAR Platform for Big Data in Agriculture in your work? 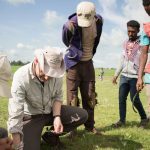 Support from the CGIAR Big Data Platform was critical to establish the partnership between John Innes, the Ethiopian Institute of Agricultural Research (EIAR) and CIMMYT and enable piloting and testing of the new MARPLE diagnostic platform in Ethiopia. The choice of Ethiopia to be the first country for initial testing was based on several key factors. Firstly, a strong national partner in EIAR; secondly, the critical importance of wheat and wheat rust diseases in the country. Ethiopia is the largest wheat producer in sub-Saharan Africa, but it is also considered the gateway for new wheat rust strains entering into Africa from Asia. 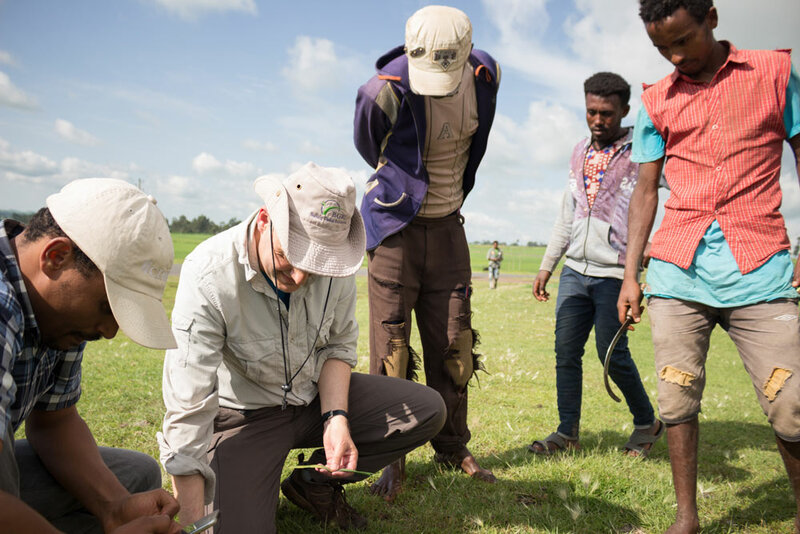 All these factors made Ethiopia the highest priority country to take the lead in testing this revolutionary new and rapid pathogen diagnostics platform. How did it impact this MARPLE project? The pilot and subsequent scale-up project from the CGIAR Big Data Platform has enabled in-country capacity to be developed, and cutting edge technology for rapid pathogen diagnostics to be deployed in the front-line in the battle against devastating wheat rust diseases. The scientific innovation in developing the MARPLE platform, coupled to the suitability of the technology for developing country partners has now attracted support and interest from other donors. Matching funds were recently obtained for the scale -up phase of MARPLE from the Delivering Genetic Gain in Wheat project (implemented by Cornell University and funded by the Bill and Melinda Gates Foundation and the UK Department for International Development). This scale-up phase of the project will see a set of distributed MARPLE hubs established and embedded within the Ethiopian wheat research system – resulting in a sentinel system for the rapid detection of new yellow rust races that is unparalleled anywhere in the world. The scientific breakthrough in developing rapid diagnostics for complex fungal pathogens using nanopore sequencing will permit the development of similar systems for other important fungal diseases in the future. The MARPLE project was selected as a 2017 winner, with the team receiving 100,000 USD to put their ideas into practice. The team came runners up for the Scale Up award the following year, receiving an additional USD 125,000 for their outstanding ability to demonstrate the project’s proven viability and potential for impact. This new publication summary was originally posted on the CIMMYT blog. Resource-poor farmers worldwide stand to gain from developments in the field of crop modelling. Photo: H. De Groote/CIMMYT. Among other uses, crop modelling allows for foresight analysis of agricultural systems under global change scenarios and the prediction of potential consequences of food system shocks. New technologies and conceptual breakthroughs have also allowed modelling to contribute to a better understanding of crop performance and yield gaps, improved predictions of pest outbreaks, more efficient irrigation systems and the optimization of planting dates. 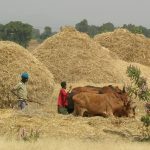 While renewed interest in the topic has led in recent years to the development of collaborative initiatives such as the Agricultural Model Intercomparison and Improvement Project (AgMIP) and the CGIAR Platform for Big Data in Agriculture, further investment is needed in order to improve the collection of open access, easy-to-use data available for crop modelling purposes. Strong impact on a global scale will require a wide range of stakeholders – from academia to the private sector – to contribute to the development of large, multi-location datasets. The authors call for closer interdisciplinary collaboration to better serve the crop research and development communities through the provision of model-based recommendations which could range from government-level policy development to direct crop management support for resource-poor farmers. Read the full article in Agronomy 2018, Volume 8 (12).